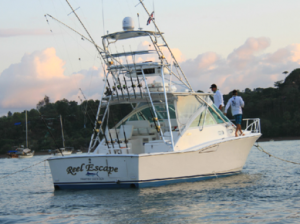 This 35ft Cabo Sport Fishing Yacht built in 2002, with experienced bilingual Captain Willy Atencio at the helm, assisted by a bilingual mate, is powered by twin 450HP Cat engines. She comes with an a/c salon, full head and full galley. She is equipped with the latest electronics (Furuno radar, Navjet GPS, Simrad Autopilot, color video sounder, Icon ICM402 VHF radio, Nav lights), USCG safety equipment, 40-gallon live well, and a full range of brand new Penn International and Shimano reels with custom built rods. The boat will go to Golfito and Puerto Jiménez for multiple days.